There has been a subject that keeps popping up in a lot in conversation lately…ticks. Just the thought of these horrid wee creatures sparks frenzied responses from people, myself included. For good reason too. Ticks can carry disease and cause chaos within the body without us even knowing we’ve become a host. Let me freak you out a bit with a couple of tick photos. You’re welcome. 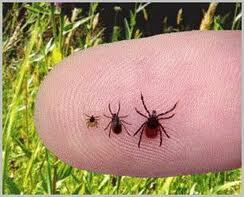 Ticks generally reside in tall grass and bushes, but this year they seem to be popping up everywhere. It is a common thought that ticks are found only in the country or in wooded areas but lately have been spotted in city gardens and lawns. A warmer than normal winter has encouraged an increase in the tick population. Great, now I feel itchy. Ticks do not fly but they seem to have, in my experience, a great ability to jump as though they were spring-loaded. Once on the body of a human or animal ticks will find a prime location (usually armpits, groin area, scalp and the nape of the neck are preferred locations) and make themselves at home by boring into the flesh. Scratch-scratch. Tick bites are generally painless so aren’t always detected quickly which gives ticks ample time to get to work. For your viewing pleasure, I present to you a burrowing tick. Once the tick has started to burrow into the flesh, there is a proper technique for removal. Trying to flick the tick off or scratch it off is the wrong method as the mouth-parts need to stay connected to the body for proper removal. If the head and/or mouth-parts separate from the body the bacteria will remain possibly causing infection. Removal with tweezers by holding as low on the head as possible and pulling back gently to extract the tick is the correct method. Removing with dish soap or Basic H on a cotton ball also facilitates proper removal, or so I am told by those that have tried this method. Putting a squirt of dish soap or Basic H (see side link to my website Live Love Be Green for more info) then placing the cotton ball over the tick for a few minutes will supposedly draw out the tick by making it stick to the cotton ball and make it slide out easier. Hope I don’t have to try this method out. I have however, had to use the tweezer-method. Last summer I had a tick attach itself to my shoulder blade. Of course one of the only spots not easily accessible for me to remove it myself. I had been working at a place known for ticks and had performed a tick check on myself before jumping into the shower after I got home. I was good to go – or so I thought. The next morning while getting dressed for work I had an itch on my back. I turned and looked in the mirror to see something dark stuck to my shoulder-blade. Ack! Thank goodness help was close by to remove the tick easily for me. 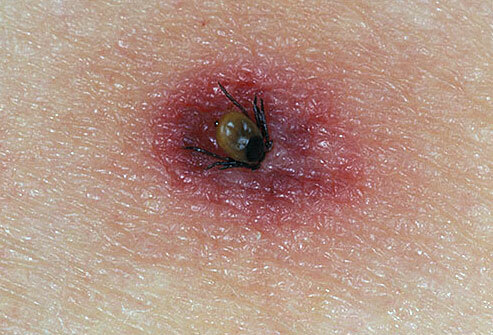 Ticks can carry bacteria that leads to such illnesses as Lyme disease. Be aware of any strange symptoms you may experience if you have been bitten by a tick and report them to your doctor immediately. Early detection is vital with any illness. If possible, keep the tick in a jar with a lid after removal in case you develop strange symptoms. 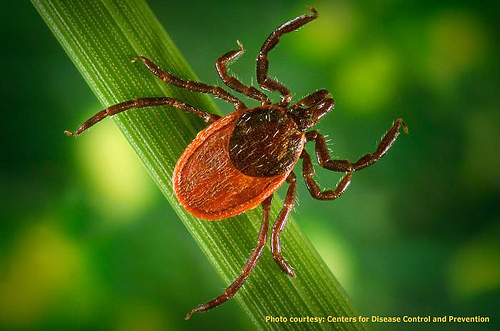 Your local Public Health will test the tick for Lyme disease if necessary. – spray boots/shoes and legs with DEET or a natural tick repellent. You want ticks to think you smell unappetizing. Don’t let ticks deter you from getting out and enjoying the beauty of Nature. Simply be aware and be proactive. Now quit scratching and go enjoy some fresh air and sunshine!